It’s the same thing every year: while everybody is heading out of the city for some much needed holiday during Holy Week, I willingly (sort of) opt to stay in Manila. It’s more like I have no choice – I work for an American client and we follow the US holidays. Though it pains me to see all my friends’ updates about how much fun they’re having at the beach, I relish the nearly empty metropolis. No traffic, no hoards of humanity… bliss. 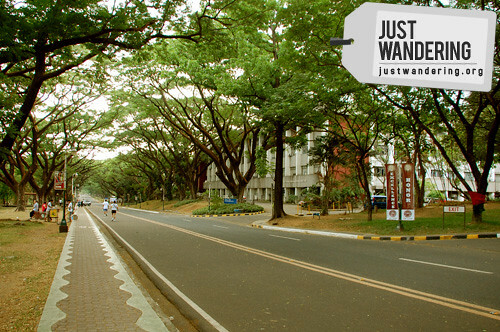 Every time I go to UP, I take a picture of this road. The streets were practically deserted. The cab ride that usually takes 30 minutes was cut in half, and I found myself in UP Diliman earlier than expected (even if I was already late). Though I’m not an alumnus, the campus is one of my favorite places in Quezon City. The sunflowers that warmly welcome you, the tree lined oval that pulls you to walk its length and the crunch of the dry grass as you sit down or lie down has a calming effect. I don’t need to travel far to feel relaxed. Two friends who have always spent Holy Week out of town suddenly found themselves stuck in the city with me. It’s been a while since we last hanged out together and though we always see each other online, there’s just no match for the bonds that form when you hold your conversations offline. 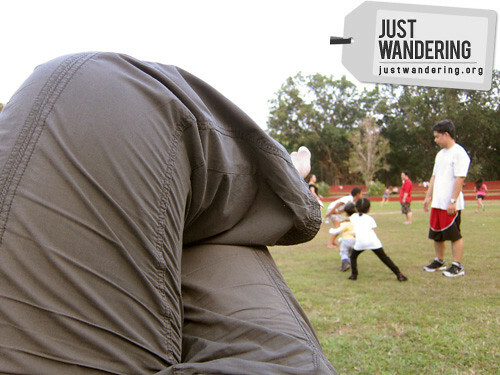 We sit on the grass, sharing the new developments in our lives as we watch the sporty-type people playing in the Sunken Garden. Sometimes we’d talk a mile a minute, followed by a cackle of laughter and there a times when we’d lapse into comfortable silence. We’re happy with just being there and being with each other. It was Good Friday and most places are closed. We ended up at the most obvious choice: McDonald’s Katipunan. It was the natural choice – the three of us all studied in the area; UP, Miriam and Ateneo – this branch played a huge part in our college life. Over Quarter Pounders with Cheese, Chicken McNuggets and French fries, we reminisced about the thing we’ve done, the people we’ve known. In between sips of Coke and McFloats, we discussed our plans for the future. It was like being back in college, except this time we’re more realistic than idealistic. Old habits die hard. It was as if we are on auto pilot as soon as we sit down in our booth. Anna opens the packets of ketchup and squeezes it unto her napkin. Mela makes sure her food never touch each other. 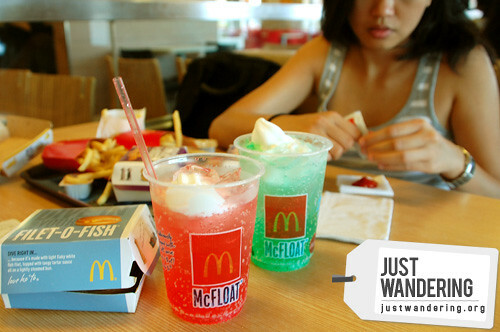 I start the meal with a couple fries dipped in the vanilla soft serve ice cream topping my watermelon Sprite McFloat. When we travel, we’re encouraged to try the local cuisine. It’s a gastronomic experience; a great way to immerse yourself with the native culture. Though this is an unwritten rule that I try to follow, I also believe in comfort food. There comes a time when you can’t stand to see another bowl of noodles and yearn for something familiar. The golden arches is almost always a sight for sore eyes for weary travelers who just got off the 4th minivan that they had to take to get from one end of the country to another, no matter how much the hardiest of travelers protest. At least it is for me. It’s as welcomed as the knowledge that the nearby McDonald’s branch is already open 24-hours, so I can have my McChicken Sandwich when hunger strikes as I work in the middle of the night. Comfort food, friends and conversations about anything and everything under the sun — just what the doctor ordered. As always, Mela finished last. She was still cradling a half-eaten burger as Anna and I polish off our nuggets and fries. I looked around the restaurant, marveling at how different it looked from the one we frequented years ago. 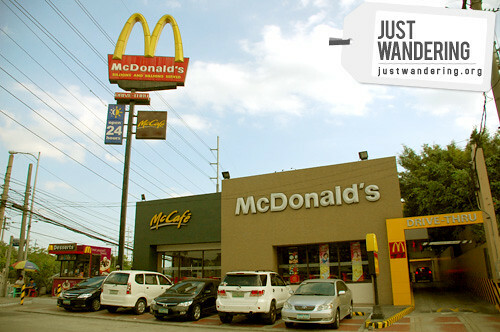 Yet no matter how different the branch looks now, at its core it’s still the same McDonald’s Katipunan we grew up with. A smile begins to tug at my lips. This may not be the grand vacation experience that others do during Holy Week, but the staycation is exactly what I needed. 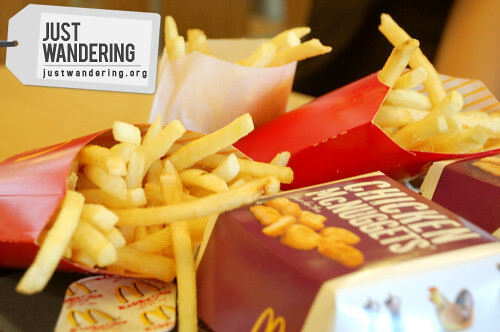 How about you, which McDonald’s do you visit the most? 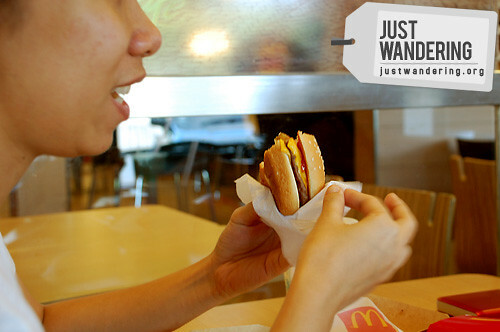 Find out which McDonald’s store is nearest you here! “as we watch the sporty-type people” – weh? mga sporty lang sinight mo teh? di ako naniniwala! hahaha!!! Wow! The UP campus that I know when I was a student failed in comparison. I always take a photo of that street as well every time I am in UP. The street’s very beautiful especially at around 4 – 5 in the afternoon. I took a photo of that street yesterday after my class. 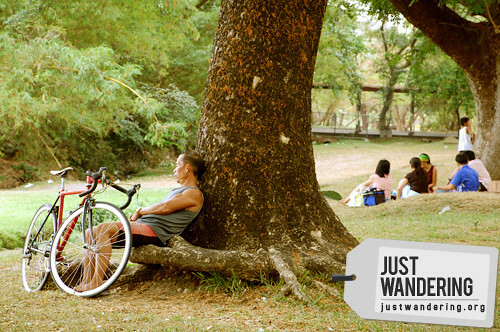 UP is a green refuge, especially now when summer threatens to melt the buildings of Manila. What makes picnics or short trips there even more magical is the serenade of kundiman from the Carillon. Hi Nina, I agree–even if it’s fast food, the good thing about it is that it’s always there. I’ve had many discussions for projects in a McDonald’s instead of a coffee shop for that reason and also because at times, the fries and the caramel sundae offer more comfort for us.